No winners in this competition: It was September 1985, and the race for several individual awards was heating up. Don Mattingly was separating himself from the AL MVP pack, while Willie McGee and Dave Parker battled it out in the NL. But the race that had the pundits the most excited was being held between Bob James, Rollie Fingers, John Kruk and Pete Vuckovich for the title of Major League Baseball's Swarthiest Player. The handlebar mustache-mullet performances from Brewers teammates Fingers and Vuckovich were legendary, but largely cancelled each other out. Kruk, who was still in the minors but officially swarthy enough for the award, jumped out to a late-season lead by showing up soil-yourself drunk to every game of a two-week home stand. 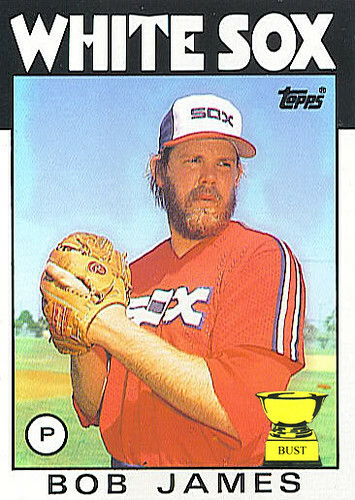 But in the end, Bob James' outright refusal to wash from the neck up helped earn him baseball's scummiest honor. Writers contended it came down to the last day of the regular season, when a passed-out Kruk was given a cold shower by teammates, costing him valuable swarth. An already sweaty James, meanwhile, took the mound wearing a stained wife-beater, ripped cargo shorts, flip-flops and a mesh ballcap with a photo of a Dodge Charger on it.